Bomber jackets have been EVERYWHERE this year and they’re certainly not going to go away for the autumn and winter. If anything, they’ve been given a serious style upgrade. Everyone can rock one as theres plenty of variety in terms of style, colour, size and budget. 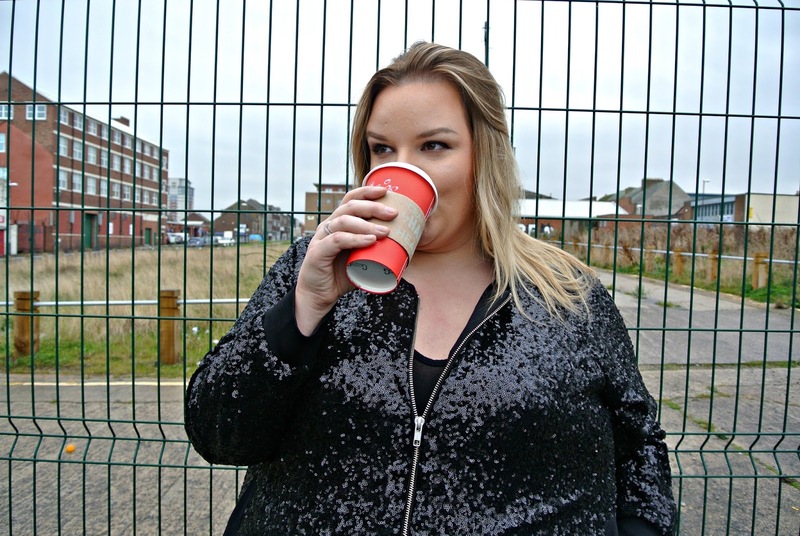 I wrote about the longline bomber that I love for daytime wear in this post but today I thought I’d share with you something a little more special… The Manon Baptise Sequin Bomber. Seriously, how incredible is this plus size bomber jacket? I get major heart eyed emojis every time I look at it let alone wear it. I first learned of plus size design house Manon Baptiste through premium fashion retailer Navabi. Season after season, they create timeless pieces in the finest fabrics with quality thats built to last. The Manon Baptiste Sequin Bomber Jacket gives a whole new meaning to the sports luxe trend. 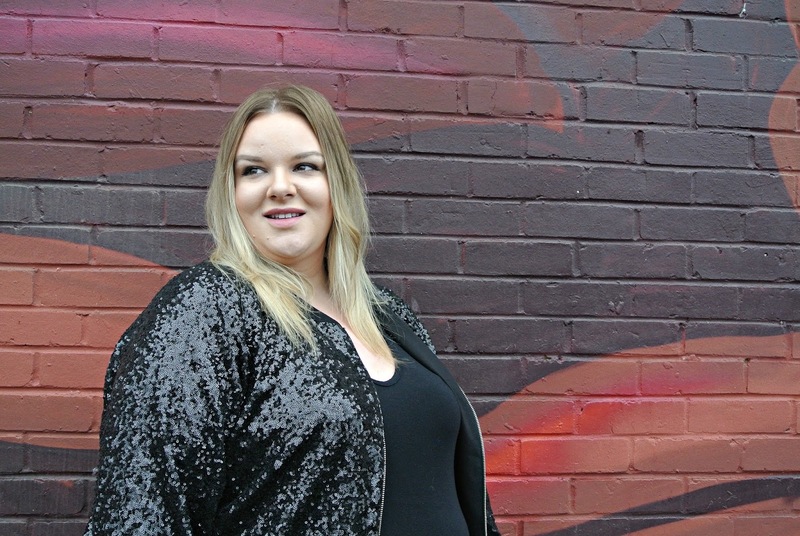 It combines the loose fitting, relaxed style of a bomber jacket with the sparkle of black sequins which instantly upgrades it to a garment that could be worn during the day or at night. This jacket is true to size but with a relaxed fit so it feels a little generous in the best possible way. I love how this jacket looks when worn open and when its closed too so I really get the best of both worlds with it. Like other bombers, this one has a mandarin collar with cuffs to the sleeves and hem which are stretchy but the quality of the fabric feels far superior to other jackets I’ve worn. There’s a pocket on either side of the bomber which come tacked together when the jacket arrives. I love that there’s pockets in this jacket as the lining is actually soft and really does keep my hands warm. The whole jacket in itself keeps me feeling warm, even with just a t shirt underneath. It has such a comfortable fit and feel yet looks sparkly and luxe to the outside world. Aside from the beautiful aesthetic of this jacket, what I love the most about it is the incredible high quality. It feels very luxe and is exceptionally well made. 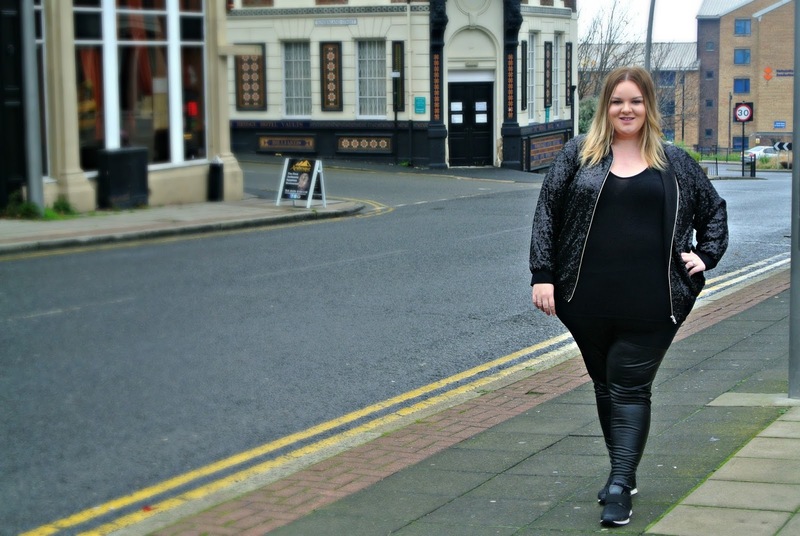 Today I’ve shown how I would style the jacket for a sports luxe daytime look, with a black t shirt, my leather leggings (similar) and my new Claudia Ghizziani trainers in black (also available in pewter) that I bought from TK Maxx. I’ve been looking for a smarter pair of trainers for off duty days for ages now and these tick all the right boxes. 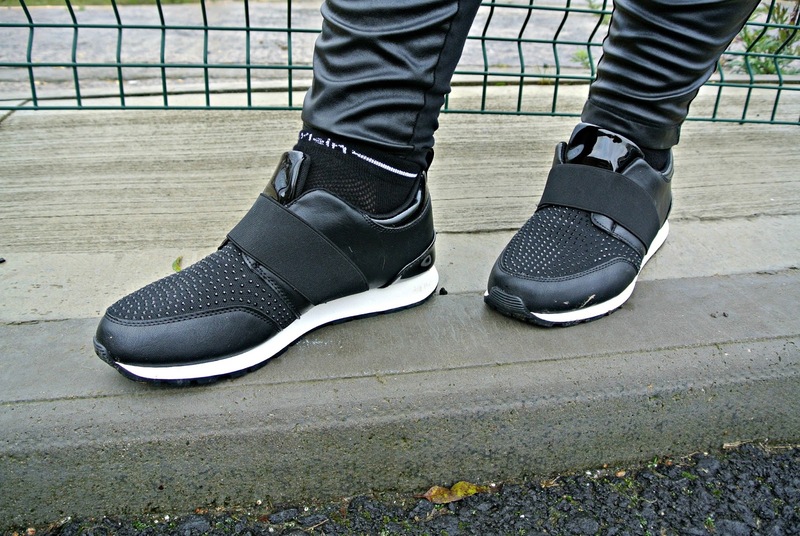 They’re so similar to the Balenciaga Race Runners with the elasticated panel but they’re at a tiny fraction of the price! I’ll also be styling this jacket up for more of a night out look very soon as it is definitely a piece that I’m going to be wearing on my own Christmas nights out. It looks great when worn with a cami, skinny jeans and heels with a little clutch bag, as you get the sparkle from the sequins but the comfort and warmth from the jacket too! Now that the festive season is rapidly approaching, I feel as though I’m going to get so much more wear out of this bomber and I can’t wait to share some more looks over on my Instagram. If you’re looking for a luxe addition to your wardrobe this winter, I’d not hesitate in recommending the Manon Baptiste Sequin Bomber Jacket. oh wow I love this jacket and love the sparkles, so very seasonal. Now I love that jacket it is absolutely fantastic – I could definitely see myself treating myself to one myself. Wow I love this jacket but then anything with sequins and sparkle is always a winner in my book. Cant wait to see how you style it for christmas! Love this jacket very sparkly and perfect for this time if year. i love how this doesn't look too sparkly so it's wearable during the day! My mummy has always wanted a sequined jacket, especially for her summer festivals – we like the fact that this is in black too! That bomber jacket is so cool. A great way to jazz up a casual outfit. I had a bomber jacket when I was a kid, but nothing has fancy as this. I love that they have made a come back! I love this jacket! I keep seeing bomber jackets everywhere but none that I was really that keen on. Really like this one though. oh my goodness I just love this bomber jacket. I've become a sequin bird in my old age. And your first photo is just fabulous! I adore this jacket and everything about it its really pretty. What a gorgeous sparkly jacket! Loving those shoes too with the nice sensible comfortable flat sole. Bomber jackets have been my favourite for years. 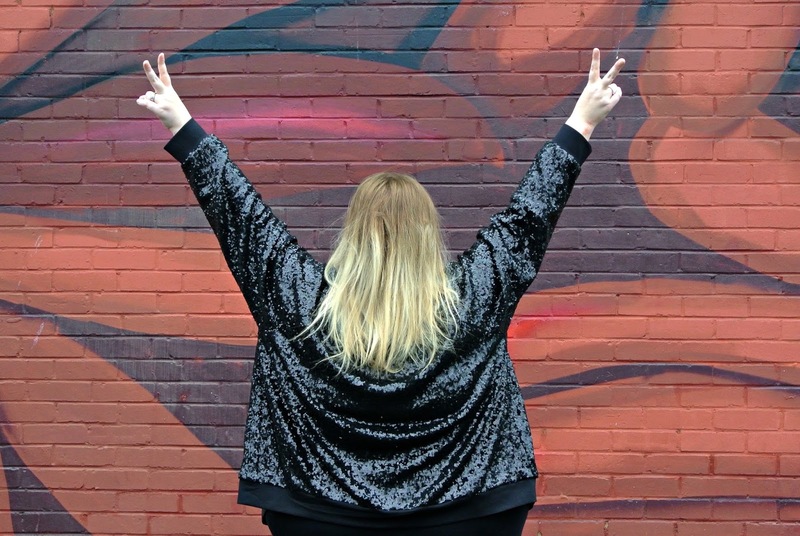 A sequin bomber jacket is a total win!